So… for several weeks now I have been working casually on a painting that really reminds me of my father, he fell in love with the songs and lyrics of this artist that my husband introduced him to and as his medical condition worsen and cancer continued its path of destruction he would listen to the songs more often. He would listen to this artists’ music every chance he had, in the car on his way to the doctor, or sitting in the car waiting for my mother to come out of Walmart because he was not able to walk more than a few steps but he insisted to go with her so he could sit in the car to blast the music out loud in the parking lot. He would always comment to me how the songs made him feel happy and at ease and were always asking for more CDs with more tracks and who could blame him, most of the songs are pretty awesome. 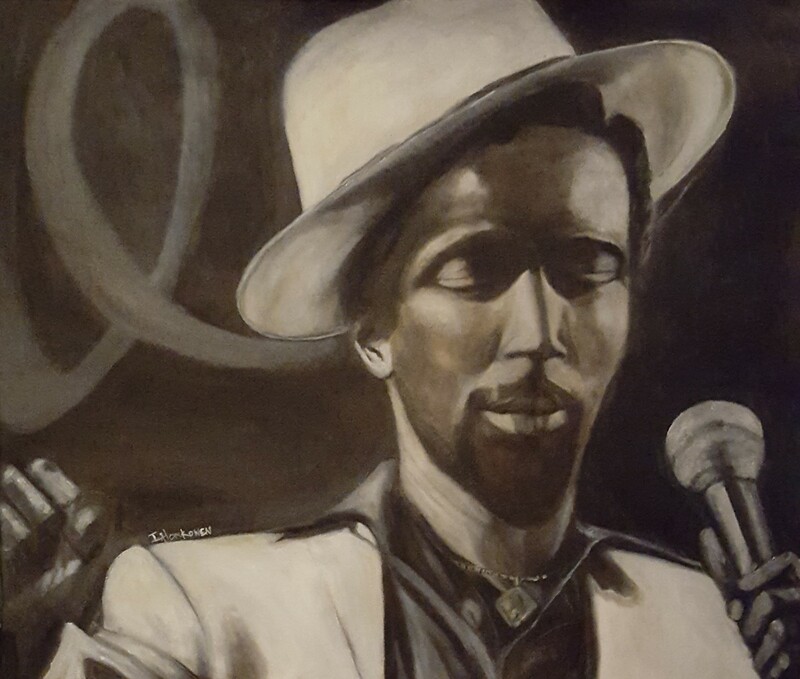 So my husband had found this picture of Gregory Isaacs (also known as the Cool Ruler) before my fathers passing and had asked me to paint it, the picture was posted on http://ireggaenation.com/roots-reggae-songs/, I looked at it and had plans of painting the image but never really got to it until recently. This is what it turned out to be… I enlarged the image a bit as I painted it onto the canvas so that I can set focus on the face more, the hand with the microphone gave me a run for the money…but anyways here’s the painting, I might mess a bit with the hand holding the mic again but for the meantime this it.